The Homeworld Remastered Collection is due out tomorrow, and Gearbox has released two new trailers ahead of the launch to show gamers what to look forward to in these epic space strategy games. The collection introduces Relic's acclaimed RTS games to modern players and operating systems; boasting high definition graphics, remastered visuals and sounds, and recreated cut-scenes by the original artists. The first trailer introduces fans to the collection and shows off improvements that have been made to enhance this seminal real-time strategy title. The video talks us through key mechanics of the new version, game play and also in-game ship classes. The second video released about the new collection brings players up to speed with the events of Homeworld, giving us a recap of the award-winning storyline of Homeworld 2. Showcasing the visual upgrades the studio has performed, it presents the gorgeous environment of the game. It seeks to prove that Gearbox has gone above and beyond its modernisation duties and that the new versions of the games will attract the next generation of game-players, not just current Homeworld fans. 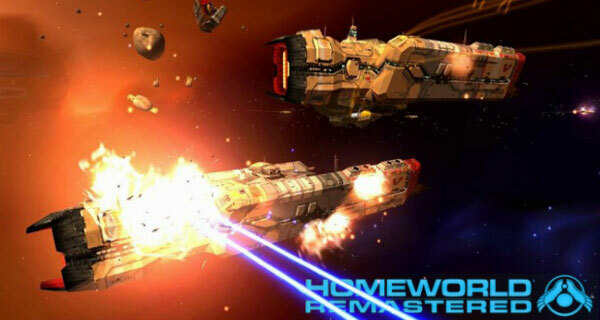 The Homeworld Remastered Collection is out on 25th February for the PC and will contain new and improved versions of Homeworld 1 and 2, along with the original 'Classic' editions of both games as a bonus. Homeworld Remastered Steam Multiplayer Beta will kick off on the release date, and will be available to everyone who has purchased the collection. The multiplayer mode will allow players to access all content (races, maps and game modes) and all improvements, features and technology from both games. Steam pre-order customers will qualify for a 'special promotion' which is simply 15 per cent off the launch price (Down from £26.99 to £22.94 in the UK). At the time of writing the special offer has 30 hours to run and coincides with the game unlock time. Still got the steam version waiting for unlock tomorrow evening!! WOOOOOOOOOOOOOOOOO! Not been this excited about a game for a long long time (possibly when I had Homeworld 2 in my hands). Concerned about difficulty pacing - both games had their flaws for different reasons in that respect. No amount of shiny new videos can address that question so I'll be waiting for user reviews I guess.